I love having linens that are only brought out at Christmas and have been gifting festive tea towels to the family since our time in Latvia. However, my stash of Christmas themed, linen tea towels bought in the factory shop in Lithuania has now run dry so it was time to get creative. 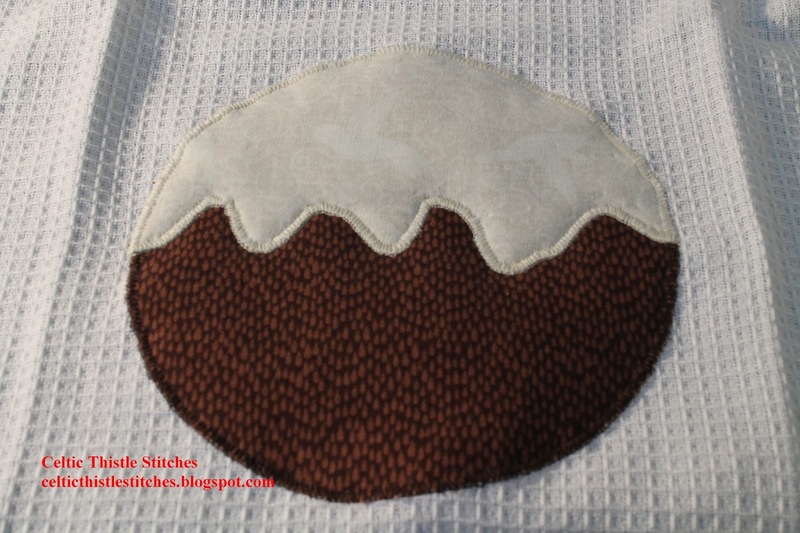 I give you my Christmas Pudding Applique Tea towel Tutorial ! 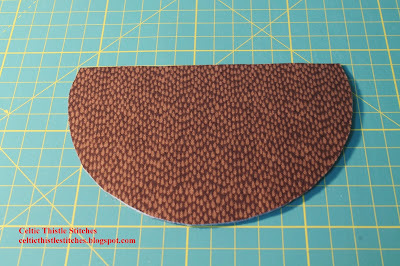 Scrap of brown fabric for pudding approx 7" x 7"
Scrap of light fabric for topping approx 7" x 4"
Scrap of green fabric for leaves approx 3" x 3"
Fuse your interfacing to the reverse side of your pudding, topping and leaves fabrics. 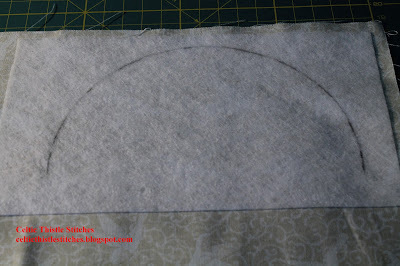 Trace a 5.5" circle on the interfaced side of the pudding fabric. Cut out the traced circle and then cut along the marked line to give you the base of your pudding. Set aside the pudding base for later. 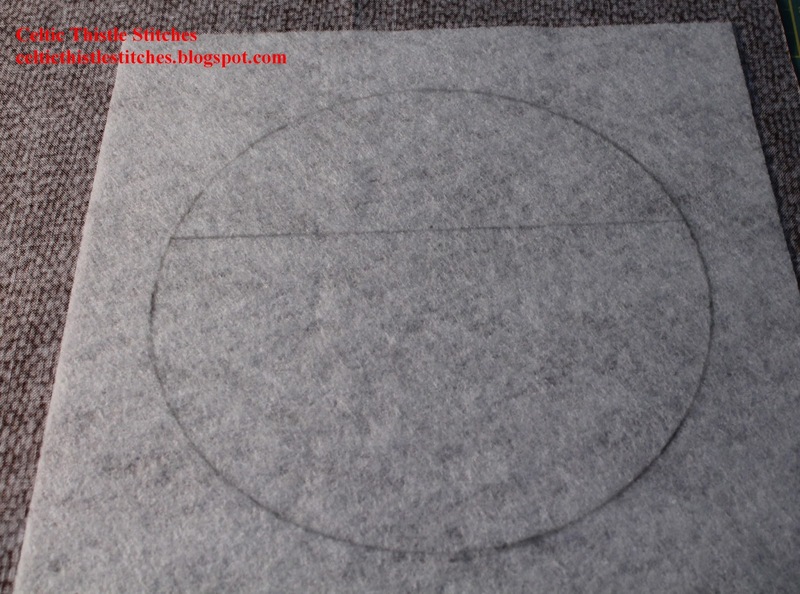 Trace a semi-circle on the interfaced side of the topping fabric using the same measurement/template that you used for the pudding. 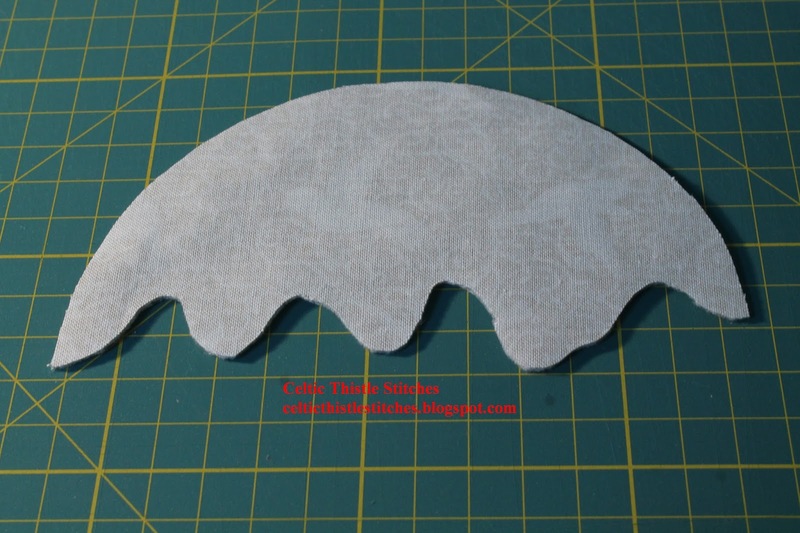 Place the top pudding piece that you cut off earlier on top of the traced semi-circle and draw freehand the wavy edge of the topping below the straight edge of the top pudding piece. See below. 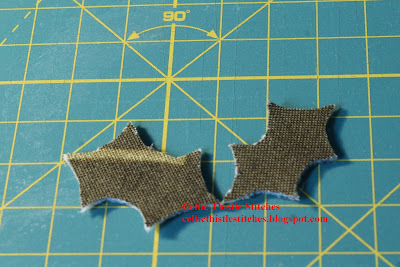 Draw two holly leaf shapes on the interfaced side of the leaves fabric and cut out. Decide where you want to applique your pudding to the tea towel. 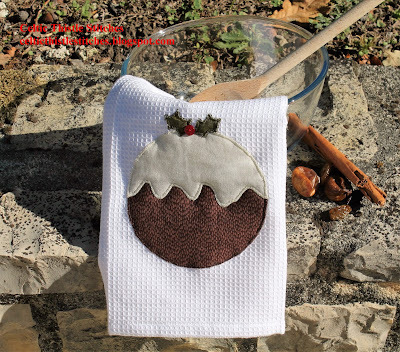 If using double-sided fusible web fuse the pudding base to the front of your tea towel. If using fusible fleece as I did, pin and baste the pudding base to the tea towel front. Matching up the curved edges, and making sure that the straight edge of the pudding is covered, fuse or pin and baste the topping piece to the tea towel. Blanket or Satin Stitch around all edges of the topping with matching thread. Repeat fusing and stitching for the two holly leaves on the top of the pudding. 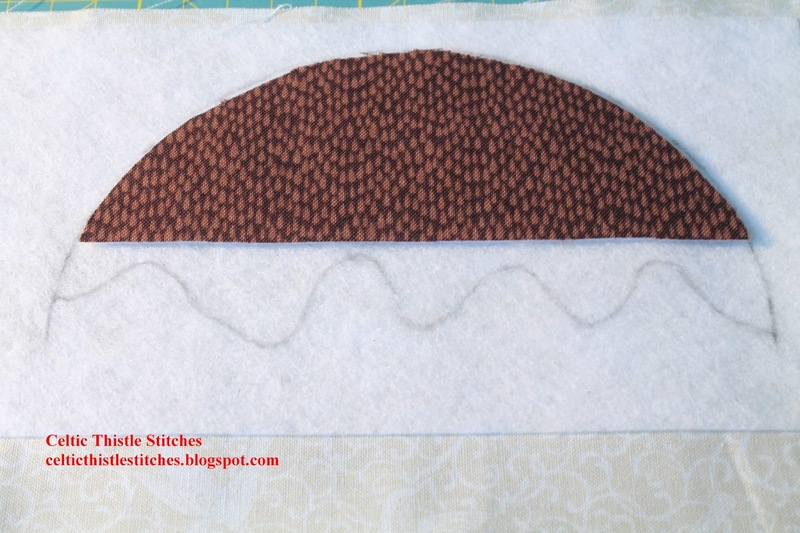 Stitch the red button on where the holly leaves meet. 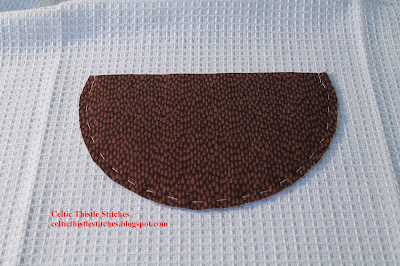 Finished in plenty of time for Stir-Up Sunday! 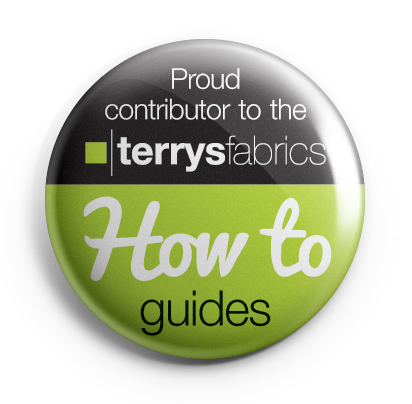 If you need more inspiration for your festive crafting, each month we add a brand-new Christmas or Holiday project to the Ho, Ho, Ho and on We Sew archive. 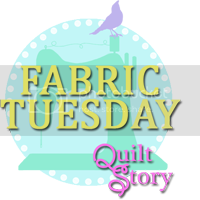 Click on the button at the top of the page to see all of the brilliant projects dreamt up to date by our fabulously talented guest hosts and be inspired! Of course it wouldn't be a Ho, Ho, Ho and on We Sew Link Party without a giveaway and this month's giveaway is sure to spark your imagination! This is so fun Fiona! 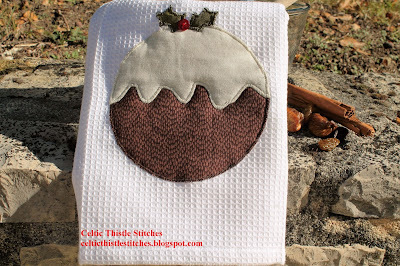 You can't go wrong with a Christmas pudding! This is such a good idea, Fiona, and one of those 'why didn't I think of it' ideas. 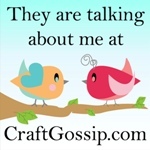 Fun, too!!! 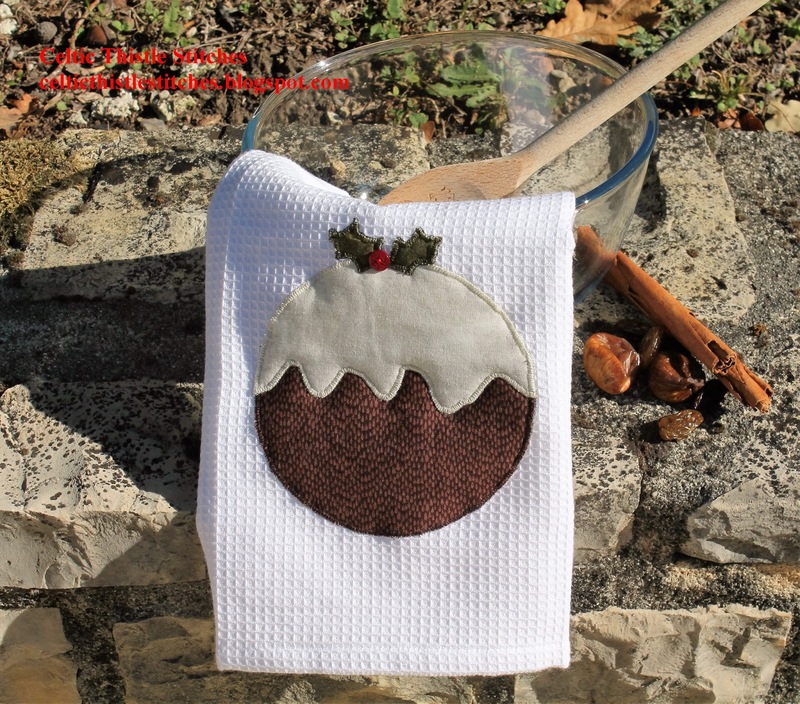 Hi Fiona, I've featured both your blog and your fab figgy pudding tea towel. Really cute design. 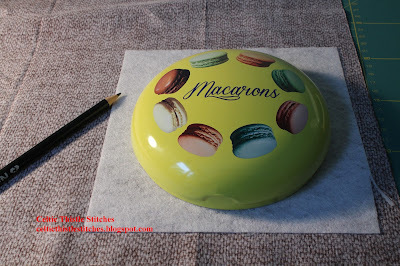 I won't be getting to Christmas yet (at least not within the next two weeks for your linkup), I have a lot of Thanksgiving and Autumn ideas to do first. That's very nice gift idea! 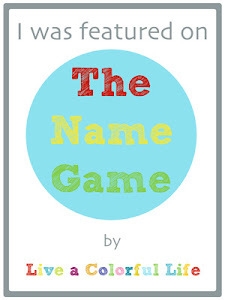 I'm only starting to think about Christmas gifts and this is definitely something to consider. The tea towel is ADORABLE :) I think it would be awesome, too, as an appliqued embellishment on a Christmas tote - with 3D holly!